It’s officially summer! And it has been for over a week now and we’re all excited here at our house. There will be less running around and more time at home. Days with nothing to do but sip lemonade while the kids happily play together . . . complete bliss. Yeah right! The fighting will be at an all-time high. I’m still trying to figure that one out. I love having my kids home, but the fighting. Aaagh! OK, so now that school is over, you’re probably faced with a massive amount of school papers, projects, journals, etc. The kids will come home with their backpacks filled to the brim with all the cute things they’ve finished up and it will all get piled on the kitchen table, the countertops, perhaps even spilling over onto the stove. Just make sure you clear the stove before you cook anything. Do you feel like scraping it all into the trash because it’s just too much? Or do you feel obligated to keep every single one of your child’s art work, bulky projects, math papers and spelling tests? Do you shove them under the bed, or pack them in boxes and forget about them? Well, fugetaboutit. There’s a better way. A much better way. Aw, isn’t that cute? And compact and precious? And just downright adorable? Wait a minute . . . what the heck is this beautiful thing? This, my friends, is the answer. 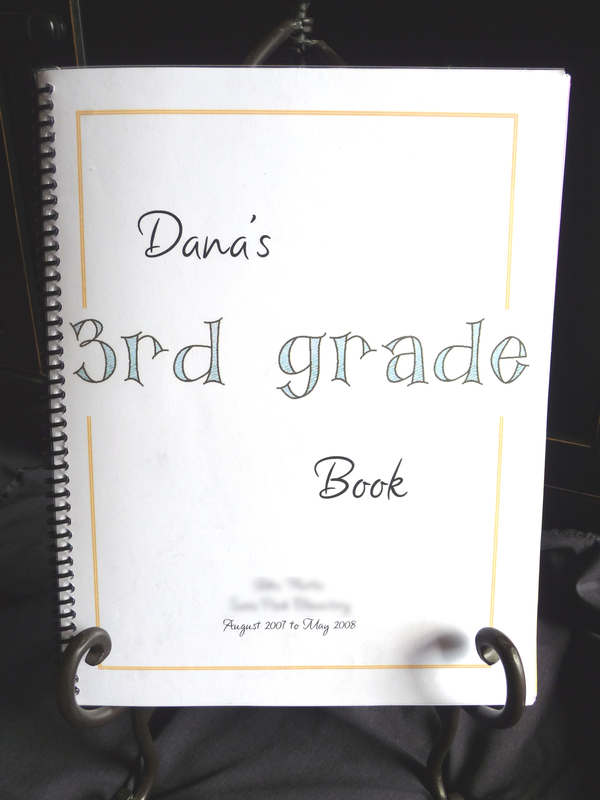 This is the “end of the year” book I make for each one of my kids during our blissful lemonade-sipping summers when we have nothing else to do except bask in each other’s company. Oh, but the fighting. I forgot about that. Back to the book: where are the bulky projects? Where are all the art pages and baking soda volcanoes? Did I ruthlessly toss them into the trash, never to be remembered? Nope. It’s like magic inside this book. Pure magic. Now for the teaser: check back soon and I’ll show you pages from the inside and what I do and how I’ve completely changed the way I look at school papers. You’ll never go back to the dark abyss of endless mountains of school stuff again. This will change your life! This entry was posted in Uncategorized and tagged artwork, papers, projects, school. Bookmark the permalink. Jenn this is wonderful! I love your ideas for this instead of having a binder full of each child’s projects. Thanks! I’ll be posting pictures of the inside of the book soon, so check back! I love it, Jenn! I’m excited to check on it from time to time and get some tips and motivation! I especially love the top of the page, simple and inspiring. As soon as I saw it I thought… relief! I can find relief here! Thanks, Steph! You’re very sweet. Jenn, you are hillarious. And, I LOVE this blog. Do you know how much I need help? And how timely this is? Right now I have huge, violent piles surrounding my computer full of the school work that I am so dreading to deal with (as well as many other things that I am dreading to deal with) and it drives Brandon crazy and me crazy but I get mad at Brandon when he mentions it because I don’t want to do it! Phew–feeling a little psychotic here. So, thanks! Keep it coming. I’m excited to learn more from you. I’m so glad you like it! I’ve been so nervous to “promote” myself that I haven’t said anything to anyone (except for Lori who’s helped me get this started). Anyway, keep checking back ’cause I plan on posting lots & lots more! I love this, I will definatly keep this in mind for when Jordan and I have kids! I need to talk to JulieAnn about doing this too. Perhaps even help her organize all of her mounds of kids school work that she still has. Thankfully she dates everything and even leaves notes/journal entries of some of the projects. Jenn, wow I love your blog! Seriously…you are the perfect person to write about organization…and you even keep us coming back with your teasers….love it!